Prettify your home with this adorable crocheted Easter basket. It will definitely add fun to the Easter festivities! In fact, this pattern is ideal for confident beginners looking for more challenging yet enjoyable crochet projects. Not familiar with magic rings? Check out this helpful tutorial: Crocheted Magic Ring [A How To Tutorial]. Once finished, the crocheted Easter basket should be approximately 6 inches wide and 3 inches tall. In metric measurements, the completed crocheted basket should have a width of around 15 cm and a height of about 7.5 cm. 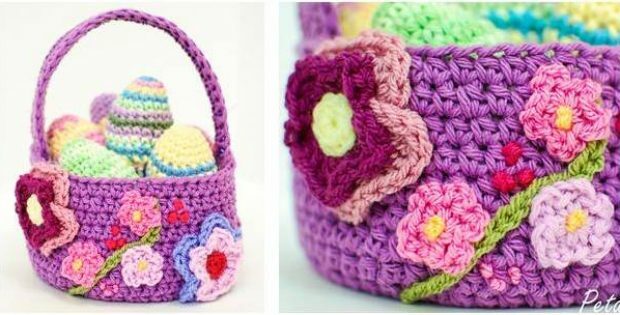 The pattern for this pretty spring crocheted Easter basket is a wonderful design by Kara Gunza. In fact, you can access the FREE pattern for this lovely crocheted Easter basket. To access the FREE pattern for this beautiful crocheted Easter basket, please click on this link: Spring Easter Basket Crochet Pattern. Featured image: Petals To Picots – thank you!